Money Matters Services & Solutions is a unique business that offers two distinct client-focused program services. Depending on your life circumstances and current relationship challenges regarding money you will find helpful information within this website and through working with our programs. Outlined below are the general services offered through our two programs: Financial Relationship Solutions (FRS) and Financial Divorce Solutions (FDS). We all have a relationship with money. Some of our behaviours and patterns are positive, while some are more challenging or even negative. Money Coaching explores the unconscious behaviours and patterns that create stress, anxiety and fear; limiting you from creating the life you desire and deserve. I started the company, Financial Divorce Solutions, to better serve those across the Niagara Region, and beyond, who want to make the best financial decisions during an emotional and stressful time. I am passionate about personalized, professional solutions that focus on the best possible outcome. 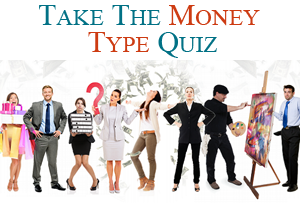 Over the years, I became increasingly aware that the money profiles of my clients were holding them back from attaining happiness and living more fulfilling lives. To better serve this need, through countless hours, I worked with the Money Coaching Institute to gain my Certified Money Coaching designation. With the business expansion of program services, to include individual and couples Money Coaching, the company name, Money Matters Services & Solutions, was registered and launched. It is with great pride I serve others to deepen their understanding of their relationship with money and help them create a better life outcome. Money Matters Services & Solutions Inc. is a proud member, or past member, of the following organizations. 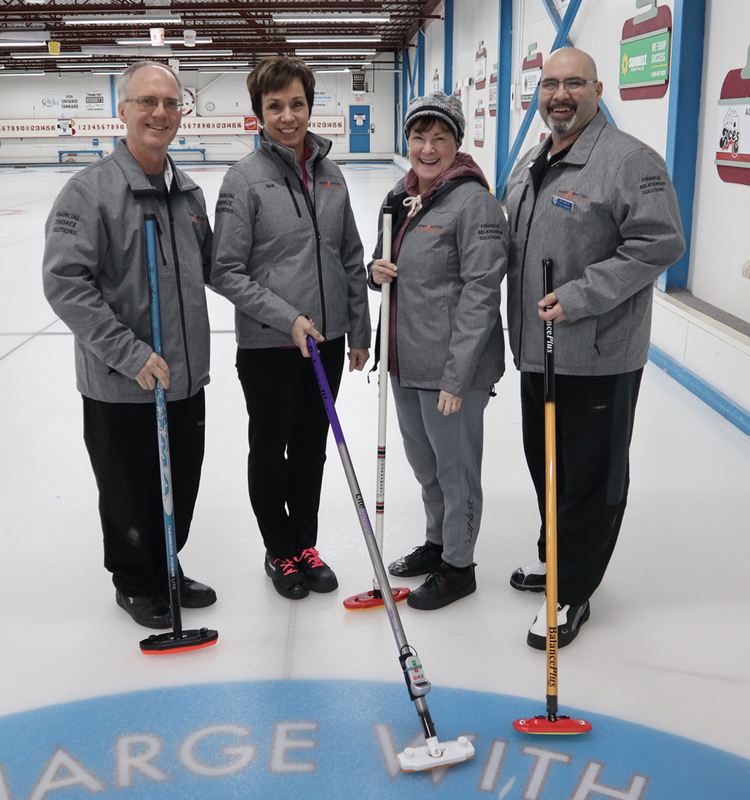 Money Matters Services & Solutions Inc. was pleased to participate in the Ontario 55+ Winter Games in Huntsville (March 5-7 2019). Supporting local and provincial community events is one of the ways we give back to our community. David’s investment in downtown Welland in his spacious and newly renovated high end furniture store displays his commitment to his customers and the city. 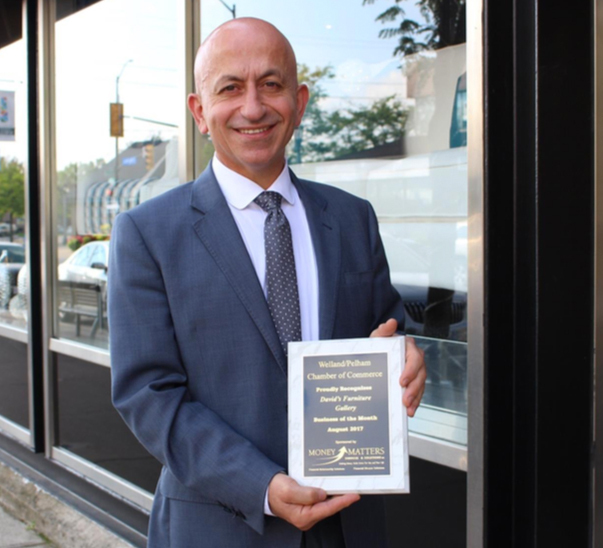 In recognition of this, and his support for local causes, he receives the August 2017 Welland and Pelham Chamber of Commerce Business of the Month award, sponsored by Money Matters Services & Solutions Inc. 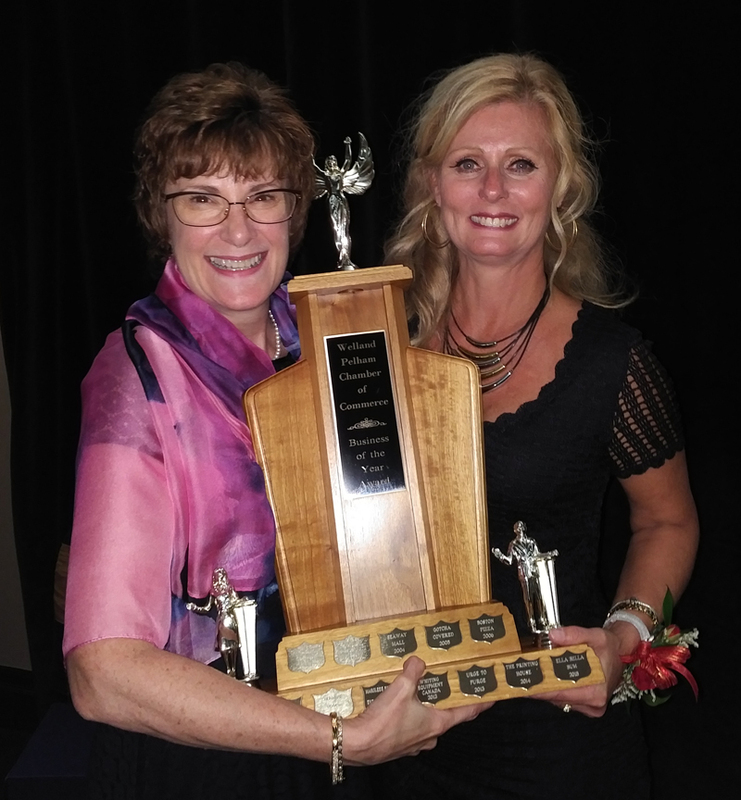 This award is well earned for their very unique business, successfully run from downtown Welland to subscribers from across the globe. Seeing two young entrepreneurs turn their passion into a thriving business, resulting in job creation is uplifting. 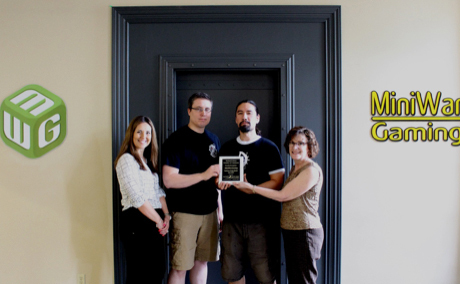 I am pleased to present this Welland Pelham Chamber of Commerce award, along side Dolores Fabiano, Chamber Executive Director to David Nordquist and Matthew Glanfield. “We were treated to a tour of their elaborate workspace. I wasn’t aware of MiniWar Gaming before entering this world of tiny figures and elaborate sets and productions,” commented sponsor Gail Belchior, Money Matters Services & Solutions Inc. Thank you to Andy Harris for LEV8 for taking time and sharing his photography talents with all of us. 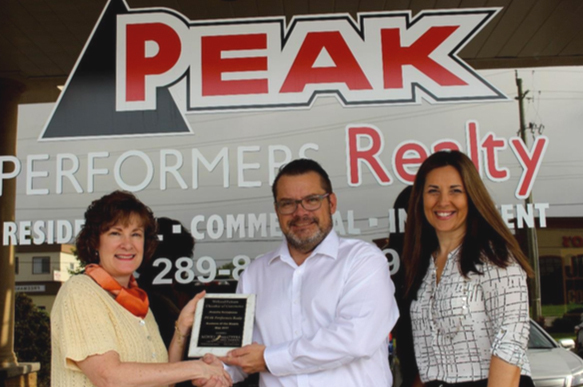 Stephen Canjar, Broker of Record/President, proudly accepted the Pelham Welland Chamber of Commerce Business of the Month award, from Gail Belchior, award sponsor, along side Chamber Executive Director, Dolores Fabiano. Photo by Andy Harris LEV8, Low Level Aerial Photography & Media. “As a Family Mediator, working with separating and divorcing couples, I know the family home is often sold as part of the couples’ transition into their new lives. Having local real estate representatives is key to helping make that a smooth transaction. I’m pleased to present this award to Stephen, who is involved in some exciting new developments and supportive of our local community. Working closely with local builders and developers gives him, and his team, a great understanding of our local market. Congratulations on the being named May 2017 Business of the Month”, Gail Belchior. 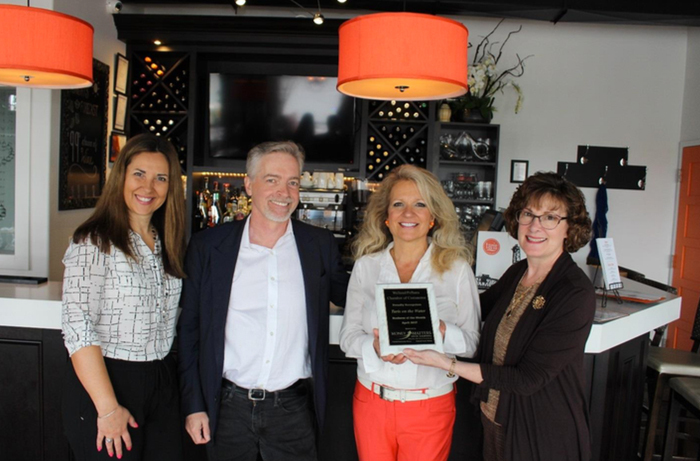 Receiving the Welland Pelham Chamber of Commerce Business of the Month award from sponsor Gail Belchior, Money Matters Services & Solutions Inc. are business owners Leda and Tom Laborie, along with Dolores Fabiano, Chamber Executive Director. Photo by Andy Harris, LEV8 Low Level Aerial Photography & Media. Taris on the Water is fast becoming one of Welland’s dining hotspots. With incredible investment in the property Tom and Leda have significantly contributed to the appeal of downtown Welland. Their community spirit and willingness to work along side other local businesses to support the economy are a few of their award winning characteristics. Along with a fabulous dining experience, including great food, friendly service and live entertainment. 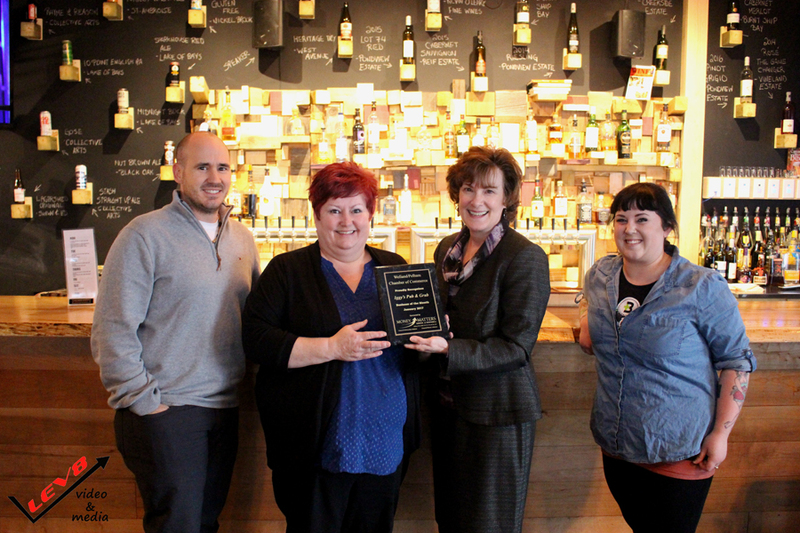 “Congratulations on being awarded as the April Business of the Month recipient. I was pleasantly surprised to find out they have a private meeting room in the lower level of the restaurant. Its décor is welcoming, bright and perfect for small family gatherings or business meetings,” commented Gail Belchior. 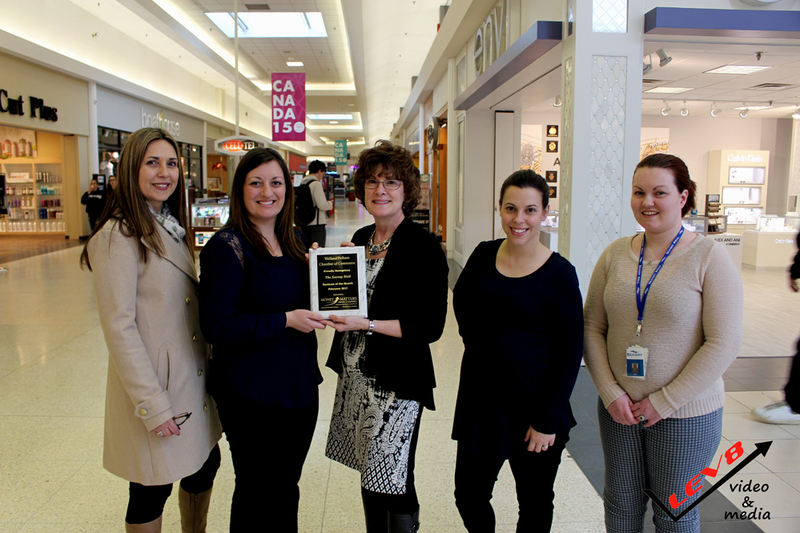 Carissa Tirpko, happily accepted the Welland Pelham Chamber of Commerce Business of the Month award from sponsor, Gail Belchior, Money Matters Services & Solutions Inc. Also present were Dolores Fabiano, Executive Director and Dayna Hunsburger and Helen Duffy. Thank you to Andy Harris of Lev8 video & media for the photo. The honour is in recognition of the innovative spirit behind the Seaway Mall to continuously re-invent itself; with the latest joint venture being with the Welland Public Library. The Seaway Mall is one of the few independently operated malls in all of Canada and a proud member of the Welland community. Congratulations on being named Business of the Month. Growing clientele, with a focus on local craft beer, and lots of food options makes Iggy’s Pub & Grub a winning combination and this month’s Pelham Welland Chamber of Commerce winner. Thank you to Andy Harris, of Lev8 video & media, for the photo of Jeff Neill, chamber past president and award winners Kim Gratto, General Manager and Erin Haag, Kitchen Manager. This is the first award to be presented by Gail Belchior from her company expansion and incorporation, Money Matters Services & Solutions Inc.
Long standing, community-minded businesses help make both Fonthill and Welland great places to live and work. 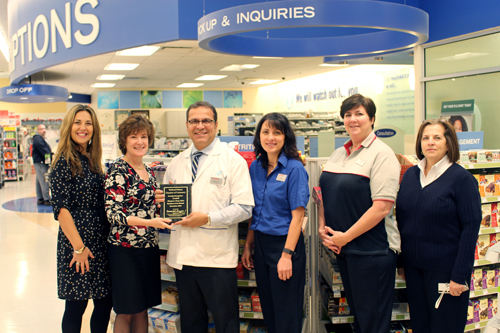 I’m pleased, that Frank Sicoli, and his dedicated team at the Fonthill Shoppers Drug Mart have been selected as the November Business of the Month winners. Its refreshing to visit their beautiful store and feel the hometown friendliness, in addition to seeing lovely donations at various community fundraising events donated by Frank and his team. Thank you all for keeping the small town feel within your large corporate franchise. WPCC Ruby awards – 2016 Business of the Year – Racheal Siciliano of Bertie and Clinton Mutual Insurance. 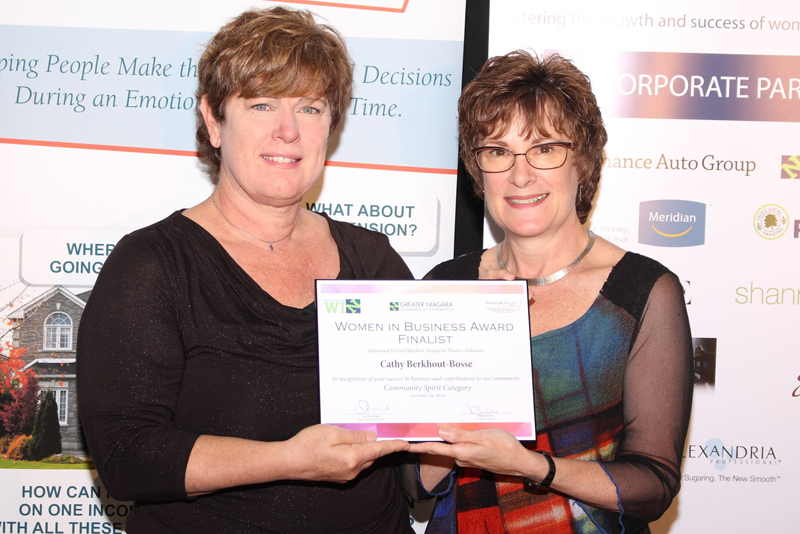 Cathy Berkhout-Bosse winner of the Community Spirit Award at the Niagara Women in Business Awards. 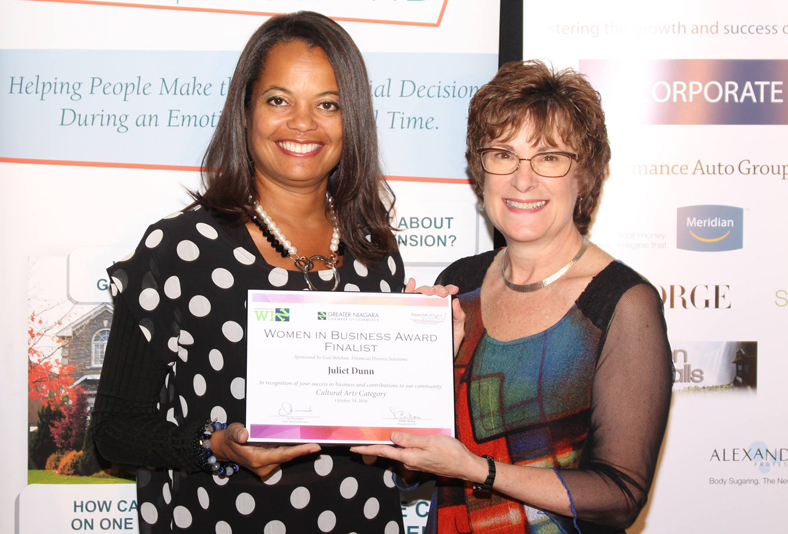 Juliet Dunn winner of the Cultural Arts Award at the Niagara Women in Business Awards. Click here to view the 2016 Business of the Month recipients.